This page describes the modification of an Albrecht AE65H with a discriminator output. This scanner is identical to the Commtel COM212 and the Bearcat 60XLT-1. 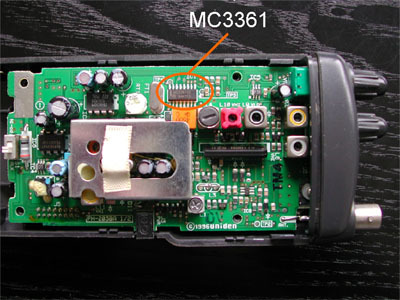 According to the circuit diagram the AE65 uses an MC3361 receiver IC. 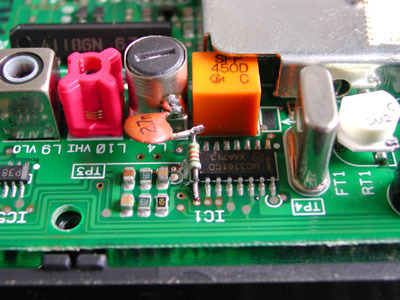 It concerns the SMD-version, so you'd better use a soldering iron with a fine tip. You can find the discriminator signal of the MC3361 at pin 9. The discriminator signal at pin 9 contained a rather strong IF-component (455 kHz). This IF-signal should be filtered, as we are only interested in FSK-signals with a maximum frequency of about 5 kHz. 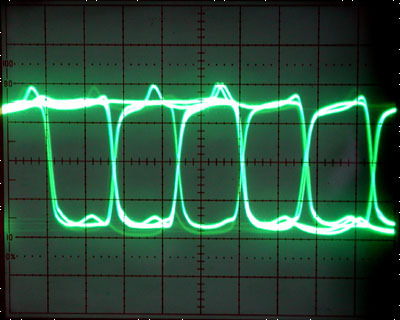 The signal after the RC-filter. A neat eye pattern. 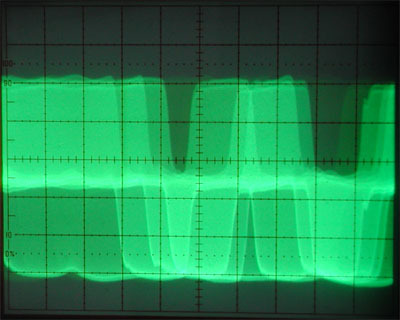 A simple way to get rid of the 455 kHz-signal is to use an RC lowpass-filter. 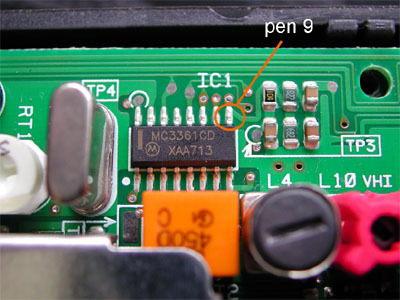 Pin 9 is connected to a resistor of 12 k. The other side of the resistor is connected to a grounded capacitor of 2.7 n. This RC-filter has a cutoff frequency of about 5 kHz, and effectively suppresses the 455 kHz-component. 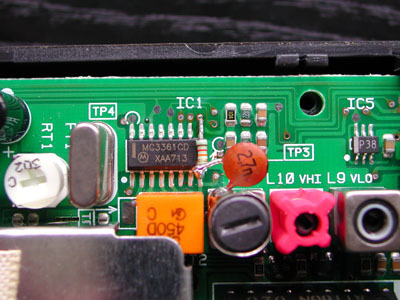 The junction of the resistor and the capacitor is connected to the inner lead of a piece of shielded cable. The other lead of the capacitor and the shield of the cable are connected to the metal shield of the IF coil nearby. This metal shield is connected to the scanner's ground. 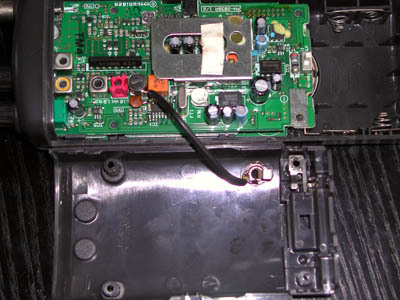 The other side of the shielded cable is connected to a 3.5 mm audio chassis terminal at the back of the scanner.